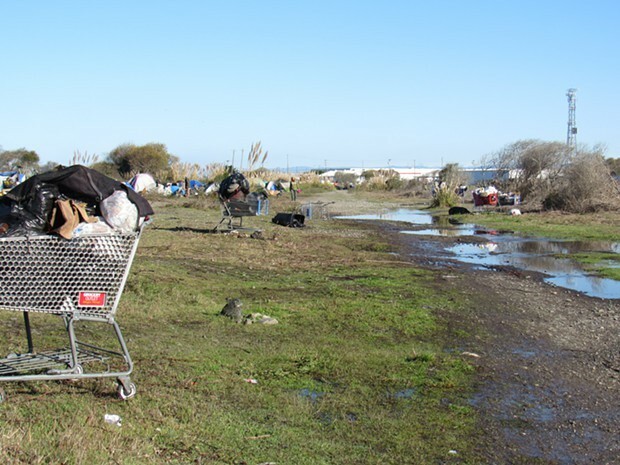 As the Eureka City Council prepares to once again discuss declaring a city-wide shelter crisis on Tuesday, the Humboldt Bay Harbor District has moved forward with a plan to reinstall Porta-Potties near the PalCo Marsh. District Chairman Richard Marks, who spearheaded installation of Porta-Potties in the Bayshore Mall's north parking lot last July, said that a similar project on the trailhead in Samoa was successful. The Bayshore Mall's original toilets were only overturned, he claims, as an act of retaliation from campers after receiving an "eviction notice" from the city. The eviction date was subsequently changed to a policy of offering resource fairs to the campers, then shrinking the footprint of those behind the mall. The estimated 150 people currently living rough in the marsh area have no toilet facilities, and the Harbor District and others have expressed concern about human waste going into Humboldt Bay. Marks said the discussion about the Porta-Potties was "spirited and lively." Ultimately the commission voted 4-1 in favor of purchasing the bathrooms, altering them so they couldn't be tipped and entering into a contract with B&B to maintain them. Commissioner Larry Doss was the lone dissenting vote. Doss also opened a discussion about the role of the Harbor District in the issue of homelessness, but no action was taken. "More or less we just had a long discussion about not being able to be a player in that situation," said Marks, adding that Doss was asked to bring back a written statement. The Eureka City Council's agenda includes a report by city staff on the feasibility of permitted car camping, with research on how similar programs have worked in other cities. The report came out of a thwarted discussion on the feasibility of a temporary sanctioned camp on city property. A city-owned parking lot at Washington and Koster was tentatively chosen as a site, but staff reported it may be a year before it is fully implemented. Further discussion of a sanctioned camp is expected, although city staff have said repeatedly that the declaration of a shelter crisis will not change the content of their reports on the feasibility of a sanctioned camp. To that end, the resolution to declare a shelter crisis in the City of Eureka developed by City Attorney Cyndy Day-Wilson and City Manager Greg Sparks, due to be voted on Tuesday, includes some changes to the original proposal that Councilmember Linda Atkins attempted to pass on Jan. 5. At that meeting, Atkins accused staff of defying her requests to put said item on the agenda as an action item, and agreed to withdraw her proposal only if a resolution that contained the spirit of the original were included in the following meeting. The resolution that will be voted on next Tuesday includes a lot of the same language in Atkins' proposal, which was modeled on resolutions passed in other cities, but omits the phrases "housing shortage" and "It is in the City's best interest to allow for the sheltering of homeless people within the City of Eureka." City staff also removed a phrase referring to "the establishment of legal campgrounds" and added a provision that the declaration should not extend to any area "within 100 feet of any environmentally sensitive habitat areas ... including, but not limited to, Humboldt Bay ... and any river, stream, estuary, slough, pond, or source of groundwater within jurisdiction of the city." The city has been adamant that the PalCo Marsh area will not become a sanctioned camp, with councilmember Kim Bergel repeatedly calling for a definitive exit date and plan. The original report on declaring a shelter crisis included some potential locations unlikely to pass muster with the public as sites for a homeless shelter, including the Sequoia Park Zoo's conference room and the Eureka Municipal Building. This new proposal includes language saying it does not specify any public facility. It is unclear what passing of such a declaration will accomplish besides freeing some potential sites from California Environmental Quality Act (CEQA) regulations. The resolution stipulates that actually identifying a site "may require further analysis" to see whether it runs afoul of CEQA, meaning that, should the resolution pass, the bureaucratic process may well keep campers in limbo for a while longer.